Take easy steps toward a healthier, more active lifestyle. 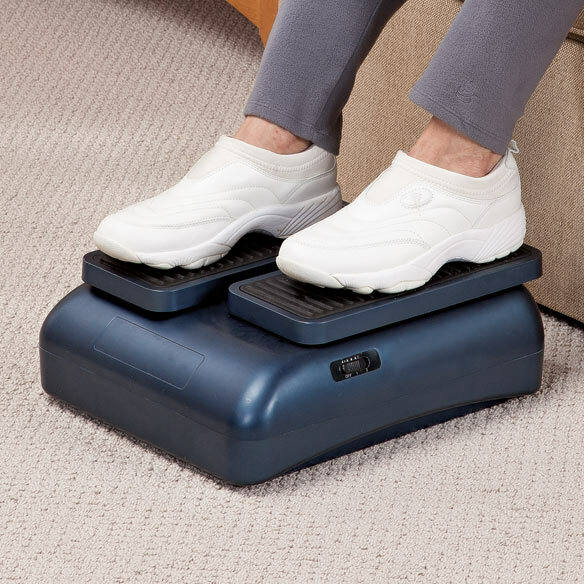 Passive, motor-operated, seated walking & lower leg exerciser uses the same principles as walking, helping you get a gentle, lower body workout while watching your favorite TV show from the comfort of your chair. Perfect for transitioning from sedentary to a more active lifestyle, this seated exerciser helps increase blood flow with the goals of improving oxygenation throughout the body and helping to prevent circulatory/venous issues. Leg workout machine helps you strengthen and tone with little to no impact. Encourages good posture even while seated for long periods. Ideal for rehabilitation, limited mobility or circulation problems. Quiet motor with 2-speed selection makes exercise effortless. 11”L x 4”W pedals adjust from 5 1/2”–8”H to fit any user. Includes 24V adapter for indoor use. Measures 14 1/2”L x 12”W x 5 1/2”H overall. Supports up to 250 lbs. ; do not stand on machine. Sounds like it could help with tightness in my legs. To help improve circulation in my feet and legs. My son is paraplegic and has spasms with bicycle exerciser. Maybe this will be better. looks like it mite help my inability to walk very well. Need leg exercising - spend a lot of time in the house now and need to get strength and circulation. to get my legs stronger. which is better and works, the seated stepper with resistance bands, or the seated walking and lower leg exerciser? BEST ANSWER: Thank you for your question. This item weighs 1.91 lbs. We hope this information will be of help to you. Do steps help feet move? BEST ANSWER: Thank you for your question. 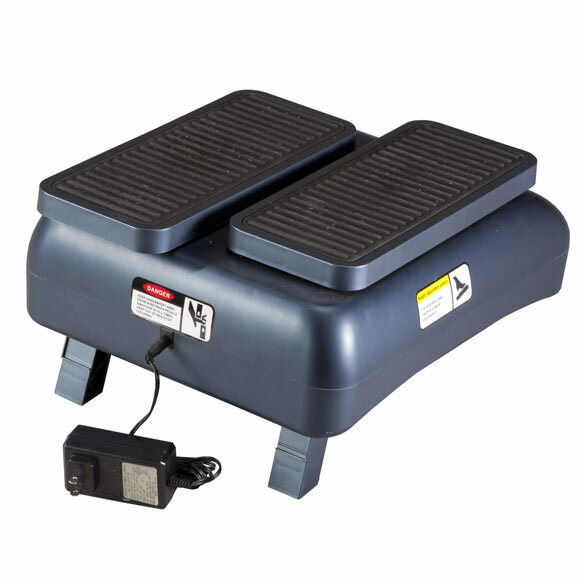 This item is a seated walking & lower leg exerciser that moves the feet and lower legs. We hope this information will be of help to you. I have one leg..will the unit still work? BEST ANSWER: Thank you for your question. Yes, as the pedals move on their own. We hope this information will be of help to you. yes . An inch & 1/4. Can this be used by someone who has a pacemaker? BEST ANSWER: Thank you for your question. We suggest you consult your cardiologist. We hope this information will be of help to you. I bought this. Been using for 5 days. Now my lower back is very sore. Am I doing something wrong or is this normal?